Be the first to share your favorite memory, photo or story of Orvella. This memorial page is dedicated for family, friends and future generations to celebrate the life of their loved one. 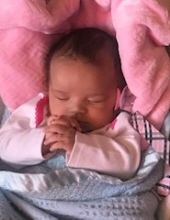 Orvella Lynn Mitchell, age 2 months, of Richlands, VA passed away Friday, April 5, 2019 in East Knoxville Children’s Hospital. She was born January 18, 2019 in Richlands, VA.
She was preceded in death by grandparents, Kathleen Kolarich, Ben Mitchell, and Jean Harman; great-grandparents, Charlie and Anna Bradsher. Those left to cherish her memory include her mother, Casandra Kolarich and her father Charles Mitchell; 3 brothers, Jr. Mitchell, Keyshawn Woodson, and Jaylen Garnette; two sisters, Kaelaine Mitchell and Amilyah Mitchell; aunts and uncles, Francen Clayter and husband Robert, Glen Mitchell and wife Barbara, Ben Mitchell, Ronald Mitchell and wife Vanessa, Louis Kolarich, Kimberly Lynn Carty and husband Michael; great aunt, Barbara Sanders; many other family and friends survive. Funeral Services will be private with Rev. Annette Warren and Rev. Phillip Horton officiating. Burial will follow at Clinch Valley Memorial Cemetery in Richlands, VA. Pallbearers will be Charles Mitchell, Jr., Louis Kolarich, Jaylen Garnette, and Keyshawn Woodson. The family of Orvella Lynn Mitchell is in the care of Singleton Funeral Service in Cedar Bluff, VA.
To send flowers or a remembrance gift to the family of Orvella Lynn Mitchell, please visit our Tribute Store. "Email Address" would like to share the life celebration of Orvella Lynn Mitchell. Click on the "link" to go to share a favorite memory or leave a condolence message for the family.